We want to present you with the best product possible, including all the information you desire. FYI: The number at the end of the title is our item inventory number. Style: Pindot Classic-Fit Non-Iron. Size: 32W 30L. PERRY ELLIS. If there is any problem with your item(s), we will take care of you, we promise, but we do need you to let us know. Color: Brown. We will notify you. Flat Front, Straight Leg, Slim Fit, Herringbone Pattern Dress Pants. Perry Ellis. 68% Polyester, 30% Viscose, 2% Elastane. Color: Gray. We are only human and may make a mistake once in a while. Perry Ellis Portfolio. Modern Fit, Flat Front, Folio Flex Waistband, Solid Tan Dress Pants. Color: Tan. We are only human and may make a mistake once in a while. Material: 100% Polyester. Flat Front, Folio Flex (Comfort Waist), Classic Fit, Birdseye Pattern Dress Pants. Perry Ellis Portfolio. Color: Brown. We are only human and may make a mistake once in a while. Polyester Blend. Machine wash cold. Relaxed leg. Sits at the waist. Folio Flex Waistband. Comfort Stretch Fabric. Wrinkle Resistant. Our accolades are as followed. Size : 32x32. Color : Gray with Red and Black Glen Plaid. Fit : Classic Fit. Size: 34W 32L. PERRY ELLIS. Style: Poly Modern-Fit Performance. BABY & TODDLER. Color: Khaki Tan. If there is any problem with your item(s), we will take care of you, we promise, but we do need you to let us know. Perry Ellis Portfolio. Slim Fit, Flat Front, Slim Leg, Black Herringbone Pattern Dress Pants. Color: Black. We are only human and may make a mistake once in a while. 68% Polyester 30% Viscose 2% Elastane. Front: Flat. Pattern: Pin Dot. Perry Ellis Portfolio Suit Separate Dress Pants. Size: 34W 32L. PERRY ELLIS. BABY & TODDLER. Style: Straight-Fit Performance. Color: Black. If there is any problem with your item(s), we will take care of you, we promise, but we do need you to let us know. 98% polyester, 2% spandex. Size 32 x 32. See all pictures for condition and details. Wrinkle Resistant / Permanent Crease / Premium Flex Twill / Folio-Flex Waistband / Comfort Stretch Fabric. Material: 62% Polyester/36% Cotton/2% Spandex. Size: 32 x 32. We will work with you. Color: Black. Slant side pockets; straight back pockets with button closures. 56% Linen 27% Polyester 17% Viscose. Classic fit. Flat front. 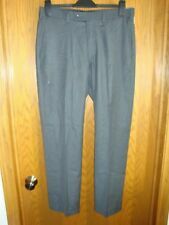 Perry Ellis Portpolio - Gray Poly Dress Pants (30x32) - Used . These pants are barely worn and in great shape. The closer picture shows the pattern but the color is dark blue as shown in other photos. Perry Ellis. Flat Front, Four Pocket, Modern Fit, Glen Plaid Pattern Dress Pants. Color : Gray. 100% Polyester. We are only human and may make a mistake once in a while. COLOR, BROWN, SIZE 32 X 32. Perry Ellis Portfolio Brown Flat Front Pants. Excellent condition. 100% polyester. Perry Ellis Portfolio. Actual - Waist 16.25" across, Inseam 29.75", Leg Opening 8.75", Front Rise 12". 82% Polyester, 18% Rayon - Dark Gray w/ Light Crosshatch Pattern. BOTTOM LEG OPENING 9 1/2". 7/10 overall condition- Small Light spot Stain on the thigh- possibly can come out with treatment- measurements provided in the measurements- Great everyday dress pants. Enjoy. PERRY ELLIS. 100% Polyester. Hook & Button Closure. 100% Authentic Perry Ellis. Style: Dress - Flat Front. Size Type: Regular. U:|Style:|Rep:|schart:yes|Minutes:1|Am Color: Blues. We get great deals from them that we pass on to you! We stand by all of our products.